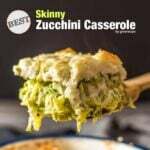 This Skinny Zucchini Casserole recipe is skinny but absolutely not a boring diet food. 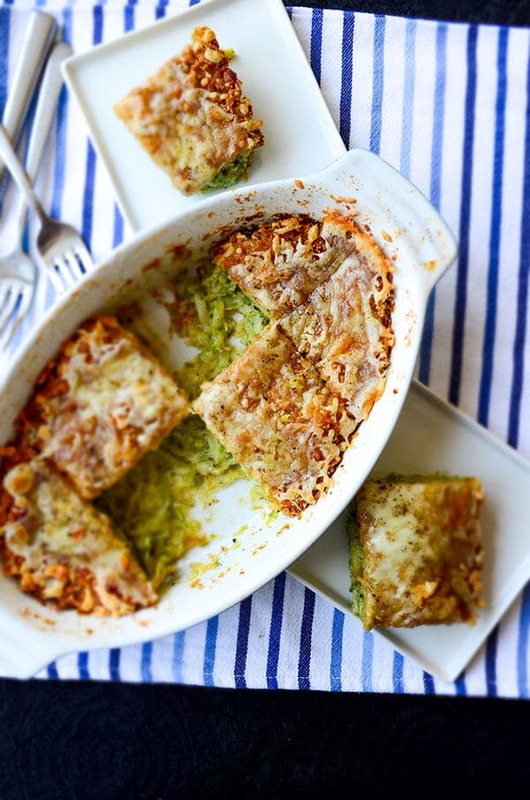 Even zucchini haters will love this tasty casserole! Serve it for lunch or as a side for dinner. You’ll miss it even in winter! What comes to your mind when you see the title of this post? Another boring diet food that has a nice photo? You will have to apologize to this Skinny Zucchini Casserole recipe for thinking that way once you have the first bite. I promise, it will become one of your favorite summer treats before you realize. You can pair it with fresh Shepherd’s Salad or Cacik, which is a cold dip made of yogurt and cucumber to have the great flavors of summer. Best part, it’s so easy to make. Just make sure you remove the juice of shredded zucchini well. You can watch the video below to see how. As a child, I remember zucchini was one of the vegetables I didn’t enjoy eating. I never refused to eat a meal made by mom, I wasn’t that kind of kid. However, there were a few foods that I found really tasteless. I can’t even tell you how zucchini has become my favorite summer vegetable now. I LOVE to create recipes with it. I can even eat it raw now, as in these Raw Zucchni Rolls. Do you love or hate it? What’s your favorite zucchini recipe? I’d love to hear them in the comments section below! It is a low calorie recipe, that’s right. But it doesn’t mean that it is tasteless and unappealing. 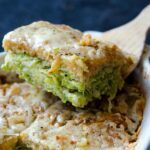 On the contrary, even zucchini haters will love this amazingly tasty, yet skinny zucchini casserole recipe. For one thing, it doesn’t contain any oil or butter. I just used ½ tablespoon butter to grease the pan. I used a few simple ingredients for this incredibly yummy zucchini casserole. When someone sees and wants to make this recipe, there is no need to go for shopping. These are some very basic ingredients that I’m sure you always have in your kitchen. Besides zucchinis, you mainly need 2 eggs and a little cornmeal and breadcrumbs, which will help the grated zucchini hold together. Also, to make this casserole that tasty, you need a little cheese and black pepper. I used kasar cheese, which is a Turkish type of cheese but parmesan works fine too. I’m planning to use ricotta next time to make my casserole creamy. If you try it earlier, I’d love to hear how it turns out. A mixture of various cheeses could even be better. Then the zucchini casserole may not be that skinny though. Personally, I feel that black pepper is a must for this recipe. You will agree with me when that very tempting smell of zucchini and black pepper fills in your home when baking. Black pepper is one of the ingredients here which saves this casserole from being boring. Make sure you strain the excessive water of grated zucchini, otherwise your casserole becomes soggy and we don’t want that. 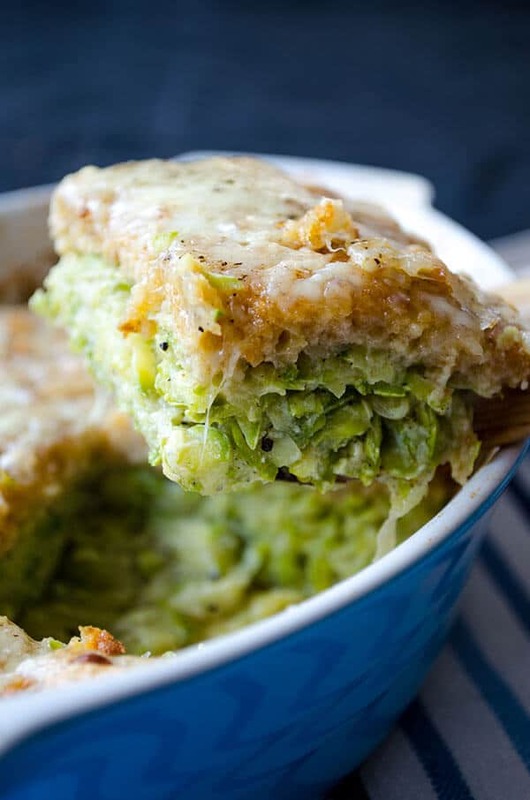 This zucchini casserole recipe is healthy and full of flavor with a wonderful golden crust. I used a combination of cornmeal and breadcrumbs and kasar cheese to have this yummy crust. You can use just cornmeal and leave out breadcrumbs if you have a gluten-free diet. A very tasty zucchini casserole flavored with black pepper and a little cheese. Place the grated zucchini on a cheesecloth and squeeze as much liquid as you can. See the video above for this. In a large bowl, whisk eggs. Add in the zucchini, black pepper and salt. Stir until combined well. Add in 1 tablespoon cheese and give it a good stir. Pour this mixture into the baking pan and spread evenly. Sprinkle cornmeal and breadcrumbs and bake for 30 minutes. Remove it from oven, top with the remaining cheese. Make small holes with a knife and bake for another 5 minutes or until the cheese melts. This looks really good, I’m going to make it tonight! Also — you mentioned cacik, are you Turkish? I’m Turkish and cacik is a staple for me and my family in summer time. Except I grew up eating it as a soup rather than a dip! Hi Ferah! Right, I’m from Turkey. Cacik is so good especially in summer. We sometimes add no water in it so that it’s thicker and we enjoy it as a dip. I noticed my daughter keeps asking for it thicker too! She likes to put it on everything. I think she uses it more as a sauce. It’s hard to keep it stocked in the fridge with her around! Oh, she’s just like me then. Your daughter knows what tastes best. You know what? My son asks for it even at breakfast. I think my family can live on it! Hi Carter! Adding milk is a brilliant idea!